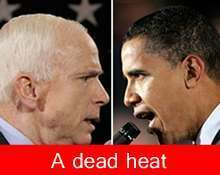 Anorak News | Will John McCain Or Barack Obama Die First? Will John McCain Or Barack Obama Die First? JOHN McCain or Barack Obama, the main player in the Barack Obama Death Cult. Which is going to die first? While many are waiting (is hope to strong a word?) for Obama to be shot, McCain keeps getting older. As Tim Blair points out: Obama is four years younger than his mother was when she was diagnosed with the cancer that would kill her. And Obama smokes. So which one will die first? Unless McCain is already dead?